Day Retreats at Winding Creek Camp! WHY: It’s easy to plan a short retreat and WCC is a beautiful safe place to grow closer with God and each other. A 6 hour block of time: We will coordinate your start time to accommodate your schedule/travel needs. An assigned space: Either a building or covered pavilion will be assigned to you as a home base area. These areas are not locked. All items needed for your group to prepare a meal: 2 hot dogs per person, with buns, ketchup, mustard, chips, a fruit, a drink, graham crackers, marshmallows, chocolate bars or cookies. The menu is standard but can vary slightly, so if there is a dietary issue, you should bring your own food to supplement. Use of camp amenities which are available: such as pool, gaga ball, pavillion, wooded nature trail, basketball, sand volleyball, horseshoes, human foosball, outdoor ping pong, creek area, and frisbee golf course. We have large open fields for ultimate frisbee or capture the flag. The tabernacle may be available for recreation such as basketball, or ping pong, in case of rain. The camp store may be open but is not guaranteed. We have some sports equipment but you may want to bring your own, especially frisbees. 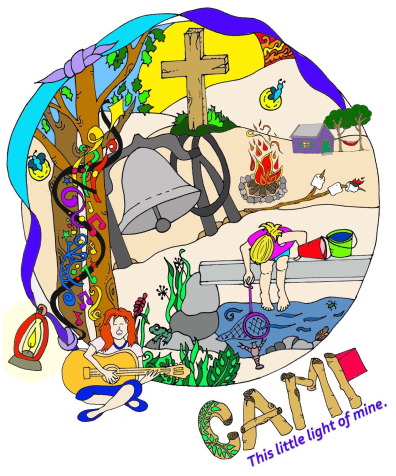 We will require a $50.00 non-refundable deposit within 10 days of confirmation of your retreat date. This $50.00 will go towards the retreat. If your entire retreat cost is less than $50.00 then the entire amount will be due. Your group will prepare their own meal over the campfire or grill. If it is raining, a microwave will be available. You can run the retreat on your own schedule (no set time to stop for lunch for example.) Everything you need such as firewood, hot dog roasters, matches, cups, paper plates, napkins, trash bags, etc… will be provided. A staff person will meet with your group at the start of your retreat to go over rules, show you where your lunch is being stored, and answer questions. You will be in charge of your own retreat. It will be a good idea to have activities planned and a schedule created. We will be more than willing to help create a scavenger hunt or give you ideas. We can also help with location ideas for small group breakouts throughout the camp. There is no lifeguard. Kids must have adult supervision at the pool and creek (no exceptions.) One piece bathing suits or tankinis are required for girls. All camp rules must be followed. There will be other people on the camp grounds. We are a Christian facility, everyone needs to be respectful and modest. Your assigned area and food must be cleaned up. Trash must be deposited in the dumpster. Your fire must be extinguished. Our mission is to strengthen families in Christ. Your retreat must meet the intended purpose of our camp or have approval. Do not enter buildings without authorization. Respect our camp.